There is nothing better than finding a mainstream mascara on clearance! While clearance can sometimes mean “discontinued,” mascaras seem like they’re a dime a dozen. There seems to be anew mascara every month from every brand, so it seems almost impossible to keep up. Beauty industry problems. 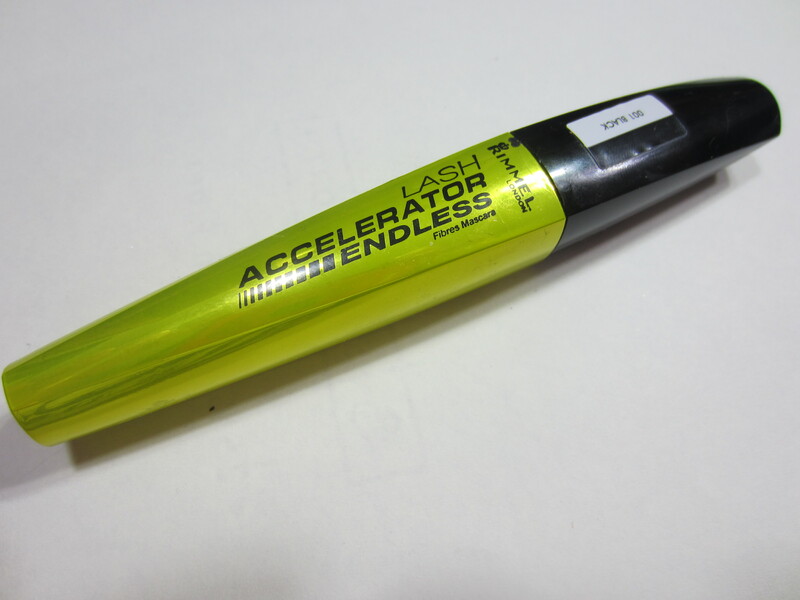 So when I was browsing through my Ulta a few months ago and saw that the Rimmel Lash Accelerator Endless mascara was on clearance, I snatched it up because I was under the assumption that it was still relatively new. Plus, the packaging still had claimed that it was a “new” product. 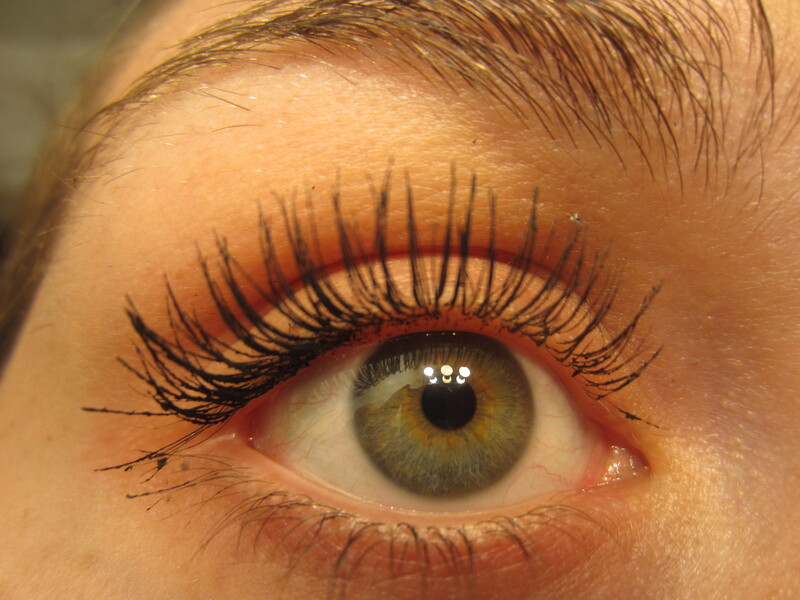 This mascara is a fiber mascara, mean to really lengthen your lashes. I also got the black color, because … well … why wouldn’t I get black? 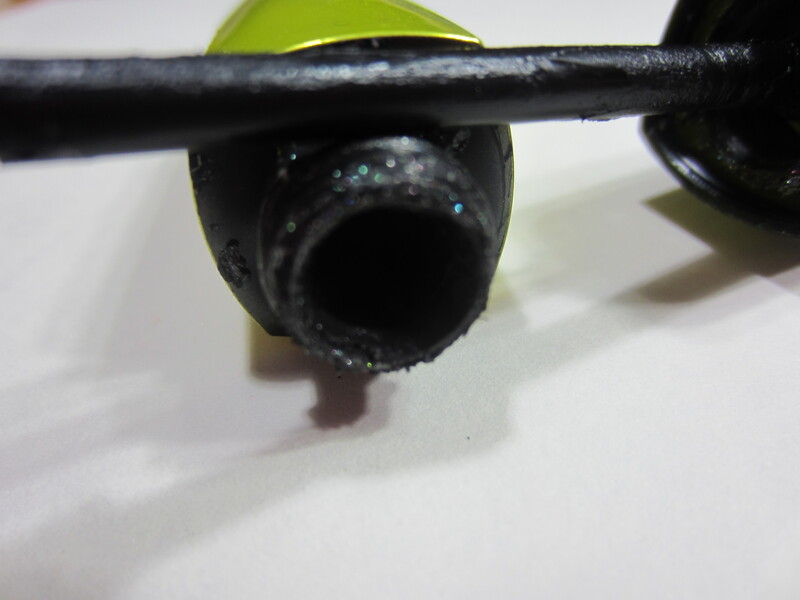 The wand is long and thin with a rubber bristle brush on the end. 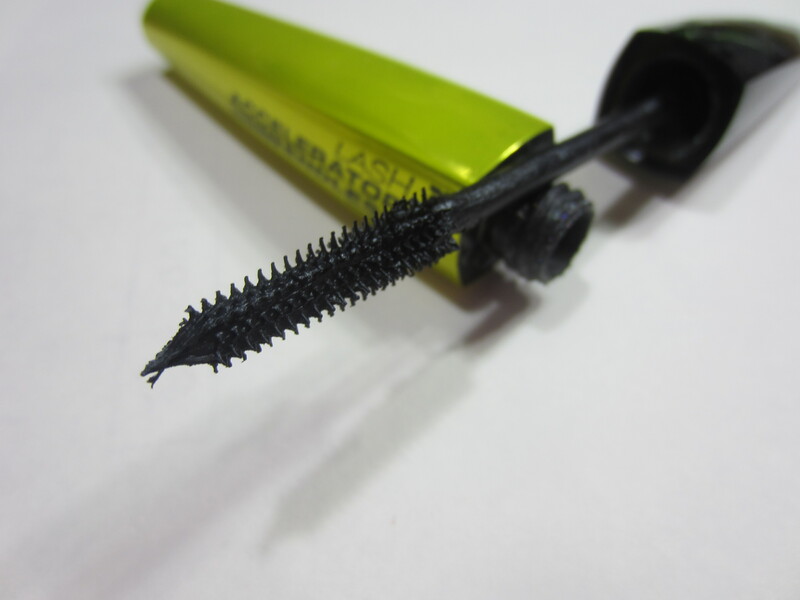 The mascara formula is a little bit on the dry side, as you can tell from the excess product on the tip of the wand. One thing I like about the wand is that it isn’t oddly shaped. It seems like a lot of mascaras come out with these weirdly shaped wands, like with torture balls and hourglasses, but this one is normal. One thing I did notice about this mascara is that there are little glitter pieces in it. I first noticed it when my mascara would wear throughout the day. It’s very rare for a mascara to wear without a single flake (even flake free mascaras will flake on hour 16), so when this one flaked around the end of the day I saw that I had little glitter pieces around my eyes. I figured it was some shadow that I was wearing, but upon looking at the tube I noticed that there is actual glitter in the mascara! That is so weird because this mascara says that it is the black color, and not some black pearl or glitter formula. And the longer I owned this mascara, the worse the glitter got! After 2 months of wear, I would have noticeable glitter around my eyes every day. What I like: I love the look that this mascara gives. It does a great job at separating my lashes and really looks amazing. 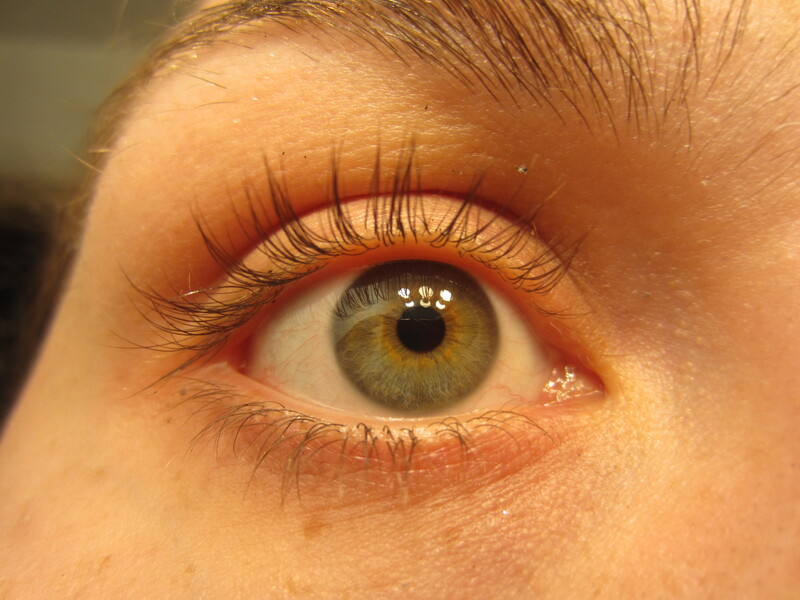 I can’t stop staring at the picture of my lashes because it really does make them look great, if I do say so myself. What I don’t like: ok, this is a long list. First off, the glitter. Who puts glitter in a black formula!?! I don’t mind glitter in my mascaras but only if I know about it and what it to be there. Glitter mascaras can be a fun touch for a night out, but maybe not for every day wear. Next, this mascara is flake city! I know I said that almost every mascara flakes but this one is the worst flaking mascara I’ve never tried! That is a big claim, I know, but this will flake on me within half an hour! No joke, it flakes off almost instantly. And not only does this mascara flake, it flakes into my eyes. Getting mascara in your eyes is painful enough but add in the fact that there’s glitter in this and imagine the torture your eyeballs endure. It was so painful I almost couldn’t handle it. Overall, pass on this! That is a hard thing for me to say considering how gorgeous it makes my lashes look, but the flaking is just too much for me. I can’t honestly recommend this mascara because it was painful and glittery and flaky. Just overall, not worth it! When there are 85 other types of mascara, you can find something much better! Price: $8.99 but you can probably find it on clearance like I did. What do you guys think? 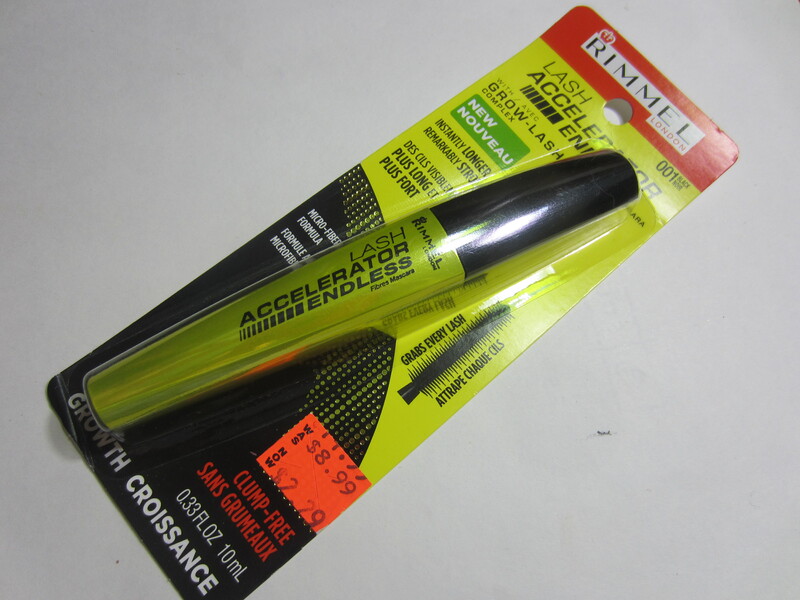 What are your favorite Rimmel mascaras? ← HUGE Haul-age! Things I’ve Bought Recently! I’m not sure if you did get a dud, because mine flakes like crazy, too. I’ve had mine open for a month now – maybe it has something to do with that? I also find it smudges, even when I’ve had my hands nowhere near my eyes. And last night when I met my friend’s new babies for the first time and burst into ugly tears, it all pooled under my eyes. And the brush is sort of picky. Maybe it was mispackaged and that’s why it was on clearance? I can’t even imagine getting glitter IN my eyes! It’s hard enough for me to find mascara that doesn’t eventually flake in my eyes or make them water, but unannounced glitter??? Yikes! yeah it was a rough one! thanks for commenting! Your lashes are crazy long! Buy seriously who puts glitter in regular black mascara?! aww thanks! and i know, who does that! i was so frustrated. thanks for commenting!